The other night we were going to a friend’s house for a Mexican feast and I was put on appetizer duty. I wanted something besides plain ol’ bean dip that I could make ahead of time and assemble there, something light, refreshing, and elegant with a Mexican flare. 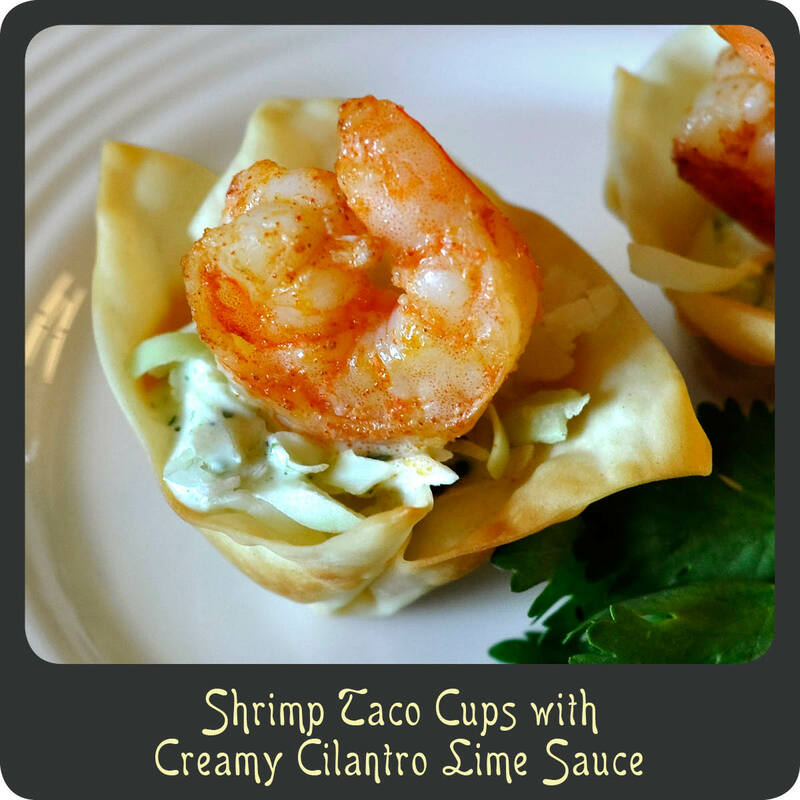 These bite size shrimp taco cups were perfect! I must admit the sauce totally makes this dish. It is sooooo good! I think I will be making it in the future as a salad dressing. It would be great with a spicy chicken breast over a bed of greens. It just has so many flavors and each ingredient really shines through. Enjoy! Note: Since these had to travel I was able to cook the won ton cups and shrimp at home and assemble them at my friend’s house. These are perfect if you are hosting a social gathering since all the prep can be done ahead of time and just quickly assembled once your guests arrive, which means more time for socializing! Perfect for the upcoming holidays. To make the sauce combine all sauce ingredients except the cilantro in a blender and puree until smooth. Add in cilantro and pulse until combined. Refrigerate sauce until ready to use. Lightly brush wonton wrappers with olive oil and arrange in a mini muffin pan making sure to press down flat in the bottoms. Bake for 5–7 minutes or until golden brown and crisp. Toss the shrimp with 1 tbsp of olive oil, salt, and chili powder. Roast shrimp on a baking sheet in the oven for 6–8 minutes or until cooked through. Remove shrimp from oven and squeeze the juice from the lime over the shrimp. To assemble fill each wonton cup with a bit of shredded cabbage, add a spoonful of the sauce, and top with one shrimp.